In 1852 Aaron Burr’s “confidential secretary,” Sampson Simson, led a group of esteemed Jewish New Yorkers to establish the Jew’s Hospital on West 28th Street “to afford surgical and medical aid, comfort, and protection in sickness to deserving and needy Israelites,” and to provide today's equivalent of emergency room treatment. During the Civil War, the return of wounded soldiers prompted the hospital to change its name in 1866 to Mount Sinai Hospital. The less sectarian-sounding name helped solicit public funding and private donations. A year later the board began searching for a less-congested site for a new building. Mid-19th Century medical theory held that open air helped promote healing and health and, in 1868, the city turned over to the hospital 12 ideal lots on East 67th Street between Lexington and Third Avenues. Here architect Griffith Thomas produced an impressive French Second Empire hospital completed in 1872. In 1875 two rooms in the basement were relegated to the dispensary for “Internal Medicine, Surgical, Gynecological and Children’s.” By 1877 the required space had grown to four rooms and by 1882 the Dispensary was seeing almost 39,000 patients and dispensing 40,000 prescriptions. A new building was clearly needed by the end of the decade. Land was leased across 67th Street where a new structure housing the Nurse’s Training School, Dispensary and the Eye and Ear Department would be built. Completed at a cost of around $150,000 in 1890, it was designed by a collaboration of architectural firms Buchman & Deisler and Brunner & Tryon. The handsome, six-story building of buff brick rested on a first floor base of rusticated stone. The restrained Italian Renaissance design marked the first and second floors of the clinic with graceful arched bays. The top four floors, the Nursing School, continued the arched motif on the end windows of the first three stories which were treated as a unit. Classical terra cotta panels separate the piers. The top floor, under a deep knee-bracketed cornice, was clad with decorative terra cotta panels punctuated by six square windows. At a time when pharmacies were charging ten cents for a two-ounce “preparation,” the dispensaries were providing prescription drugs for free. In addition, the Mount Sinai Dispensary sent trained nurses on house calls at no charge to those unable to travel. The situation provided fertile ground for abuse of the system. Relatively minor changes to the dispensary system were implemented to ease the abuse and the Mount Sinai Dispensary continued its medical service well into the 20th Century on 67th Street. 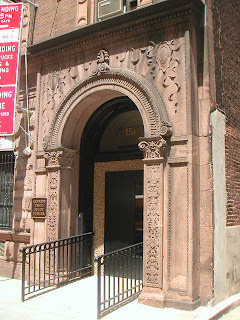 In 1987 the building was taken over by The Kennedy Child Study Center, established in 1958 by the Archdiocese of New York. The center had been established through a grant from the Kennedy family as a memorial to Joseph P. Kennedy, Jr. and in response to Rosemary Kennedy’s mental retardation. The non-profit agency is geared to very young children – from infants to 5-year old -- with significant learning difficulties and developmental problems. 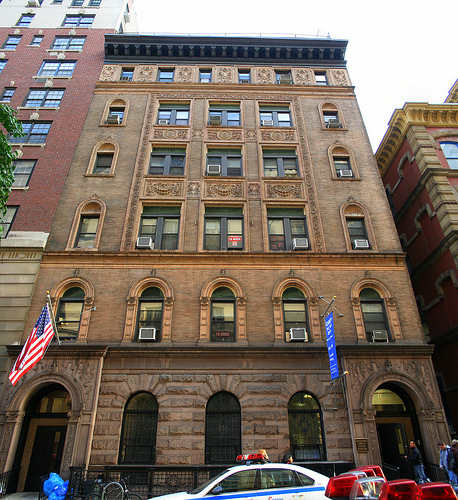 The former Mount Sinai Dispensary building, which the AIA Guide to New York City termed “eclectic, but dignified,” still functions under the Kennedy Child Study Center as the care-giving sanctuary it was first intended to be. As a Daughter of Charity, I worked and then lived in this building as early as 1969. It had been Kennedy Chikd Study Center for many years then...way before 1989.